An underground online gambling culture exists with Counter-Strike: Global Offensive, where players gamble with skins that can be bought and sold for real money, up to thousands of dollars depending on rarity. There’s no shortage of ways that the skins can be won and lost, ranging from professional CSGO matches to casino games on third party websites and even simple coin flips. Since there is no real money directly involved, these activities don’t fall under standard gambling regulations and all that underage players need to do to participate is to click a checkbox stating they’re over 18. 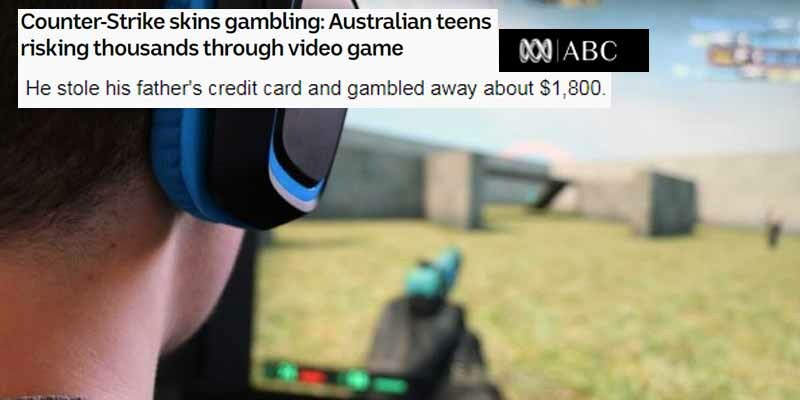 Sites that facilitate the buying and selling of skins (like SkinXchange) report that every day, they’re calling clueless parents to report that Junior is trying to dump thousands of real dollars on skins that they’re then going to head off to gamble with, like 18yo Jordan Bruce from Brisbane Australia, who stole his father’s credit card and racked up an $1800 bill.